My children love the show the Dinosaur Train, so I decided to make their costumes as characters from the show. 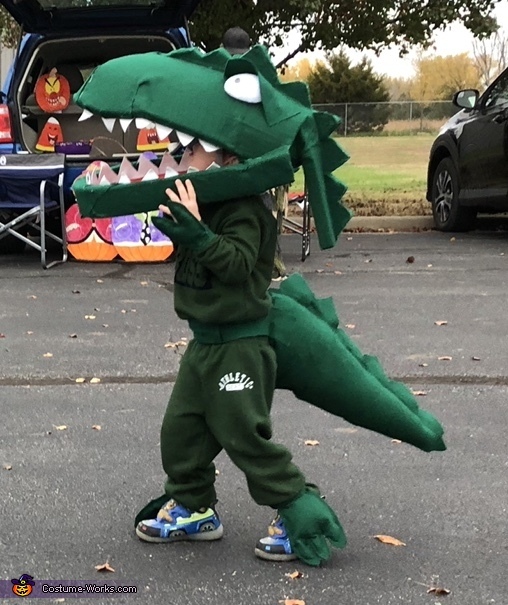 My son (age 3)wanted to be the large green dinosaur (T Rex) and the rest of us were other characters. I used a kids bicycle helmet to base the heads on (modeling off some directions I found online), upholstery foam for the shape of head, and lots of felt and stuffing to do the rest. There were 6 parts to this costume (head, tail, 2 hands and 2 feet) All were attached with Velcro for easy on and off. I hot glued everything. Also, we used just plain clothes underneath for ease and limit cost that wouldn’t have another use (green sweats set). All in roughly $25 in materials for the costume (does not include the sweats). My son has played with this costume everyday since I started making it! This entry is for the child division.